◆The 4 legs stool can be used everywhere such as beach, garden, home, mountain and fish places. 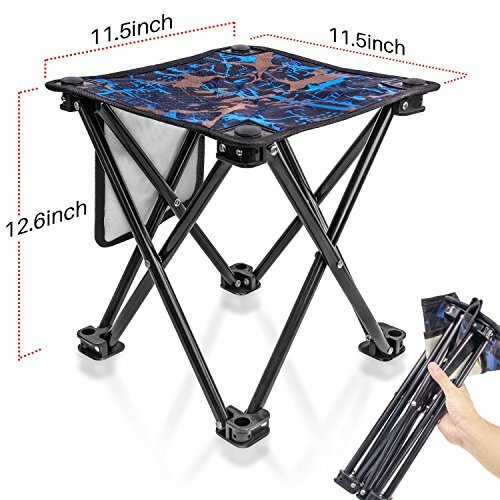 They can also be used for hiking,hunting,fishing,travelling and climbing, If you are looking for a portable and comfortable folding chair,it is the best choice for you. ◆High quality 600D double Oxford fabric,super strength,toughness, much stronger than normal fabric, and high quality steel frame endure long-time using. Four legs gives sturdy support and it will never makes you tip over. Square seat ensures comfortable sitting experience. ◆Mini folding stool can be folded into a compact size,Ultra-light and easy-carry,will not take much space,suitable to keep in the car just in case to be used and it can be easily put in a packing bag for convenient carry. ◆Anti-slip feet to increase traction on diverse ground, Four legs camping stool gives great support. ◆Mini folding stool designed for ease in traveling,set up quickly,suitable and useful in all areas and activities. ★SMALL SIZE&SAVE SPACE : Unfold Size:11.5"L x 11.5"W x 12.6"H; Fold Size:14.5"Lx4"H; Maximum Load Weight: 300lbs. ★DURABLE AND COMFORTABLE: The Folding Chair is made from 600D double Oxford fabric and 6063 Aerospace-grade aluminum high quality steel pipe which is 0.5 inch thickness and 0.6 inch diameter.The steel frame is ultra-light but can holds 300 lbs.Four legs design providing better support,even if you won't be tired for a long time sitting. If you have any questions about this product by Aiwoxing, contact us by completing and submitting the form below. If you are looking for a specif part number, please include it with your message.